Journaling has changed my life. If you asked me to pick one thing to take to a deserted island, I would bring my journals. My journals tell a beautiful story of how God changed my life and continues to work in my heart. Prayers, moments of sadness, moments of complete joy, scripture that touched my heart, lessons God has taught me, notes from sermons, and so much more. Focus in prayer. I love writing my prayers to God in letter form. Often when I pray to myself, my mind drifts away and I lose focus. When I write out the prayer, I’m able to stay focused on God. Trust God. You begin to trust God more when you see that he is faithful. Rereading old journals is one of my favorite activities! I will read a prayer from two years ago and realize that God answered it. When that happens, I sometimes write the date next to the prayer so I will remember God is faithful. This is great evidence that God cares, listens, and answers for days when I doubt him. Believe God loves you. The Bible is a love letter to us from God, so why not write it like one? I will take a passage and write in my journal, “Dear Joy…. (insert scripture) Love, God.” These letters help me further believe God’s love for me. Understand scripture. I learn through writing, maybe that is why I love journaling so much. Writing the verses out in my journal helps them seep into my brain. Stop thinking. Before bed, countless thoughts roam through my head. If I don’t write them down, I won’t be able to fall asleep. Journaling takes the thoughts off my mind and helps me fall asleep. Teach others. I write down everything, pretty much, especially when I’m going through a struggle. Then when a friend goes through something similar, I can pull out my journal and share with her verses or sermons that helped. This is a way to encourage her and teach her. Remember. I never want to forget the amazing things God does in my life through the years. My journals become a yearbook of all the beautiful memories between God and I.
I hope this post has encouraged you to start or continue journaling! Sign up for the monthly newsletter to stay connected! —->>> Sign up today! « Why did God create us? Hello! Thanks for your encouraging comment! I hope to stay connected as well. What is the monthly community meet up for journalers? I would love to hear more. Thanks! Thank you for sharing your inspiring article at Inspire Me Monday at Create With Joy! As you know, I am a big advocate of journaling of all types! Congratulations Joy – you are one of our featured guests this week! Oh cool! Thank you for the feature! Writing is such a cathartic release. Thank you for linking up with Manic Mondays! In my mind I already have a lot of reasons why I should be journaling and somehow it does not seem to happen. My husband struggles with the same thing. It is neat to see someone so authentically passion about journaling. What would you say to people who find value in a journal but just can’t make it stick? Are you literally hand writing your journals? What about prayer requests? I think I stopped because I realized I was just writing out my small group prayer list every day. Maybe I should stay in paragraph form rather than reducing my prayer to bullet points. Thank you for your comment Allie! I am literally hand writing in my journals. I have filled 10 in two years. If you value journaling here are some ideas: any time God does something cool in your life, write it down. It is worth taking the time to do this. Put the journal somewhere you’ll see it, near your Bible, on your dressor, etc. I was writing my prayer requests in my journal, but found they got lost along the way. I decided to write them on the last couple of pages in the back of the journal. This makes them easy to find and then when I get a new journal they are easy to transfer. I bullet the points, so I don’t forget them. But then if I pray by using my journal I’ll write out the prayers back in the front with the rest of my entries. I hope this helps! Thanks for joining the mom lovin party last week! I used to journal a lot but haven’t much since the birth of my son almost 2 years ago. These are such great reminders why I did so. Hello Joy ! I used to journal a lot when I was a teenager. I lost the art and I think I should go back to it especially to record those “God-moments” in my day when the Holy Spirit drops things in my spirit. That’s very good! I have such a bad memory too. i need to write a journal! I will link up! thanks for the comment! Hi Joy! I am coming over from Sharing His Beauty. I can really relate to all your reasons for journaling. Thank you for sharing the wonderful ways you can use this practice to increase your faith life, and help others. That’s what we’re supposed to be doing here! I do journal, but I’m sporadic. I do like going back and reading them to see where I was in my life, and how God answered me, even if it seemed like he was silent at the time. Thanks for the comment Ceil! I’m glad you came by to check out my blog. I’m thankful for Sharing His Beauty. I started blogging as a means of journaling for my children. I wanted them to know what their mom was thinking & feeling even long after I leave this earth. It has become such a joy for me as I have found it to seal in my heart all that I am learning & experiencing with God. Great post! So glad I visited from Thankful Thurs. Blessings! Thanks for the comment! I will be sure to check out your blog =] I’m very thankful for thankful thurs! I love it! Thanks for the comment Becky! All your reasons are so true, Joy! I learn through writing, too. And I see my journals and blog posts as “standing stones”, like the ones God instructed the Israelites to erect to remind them and their children of what God had done for them. Great post! Thanks for your comment and encouragement!! I love that example! We are neighbors today over at Jennifer’s place for TellHisStory! So glad I popped on over! I am a HUGE Journaler as well and just recently started to dive into Art Journaling… oh my! It’s a whole different level! Great post! Thanks for the comment Karrilee! I hope you subscribe via e-mail or follow me on social media so we can stay connected. I have yet to try art journaling! You should post photos because I would love to see some of your work. I love journals! I have a few. When I got married I decided to make a “marriage journal”. I write down any marriage advice, scriptures etc that I get from any source, people, devotionals, wherever. I also have a children’s journal. I write down things I want to do with my kids one day when I have them, things I want to teach them, scriptures, advice etc. I have always loved journals. Its a good way to look back on your life and see how far you have come. Those are some great ideas! Thanks for the comment. You could even write a blog post about your ideas! Hi Joy! This is a great post! 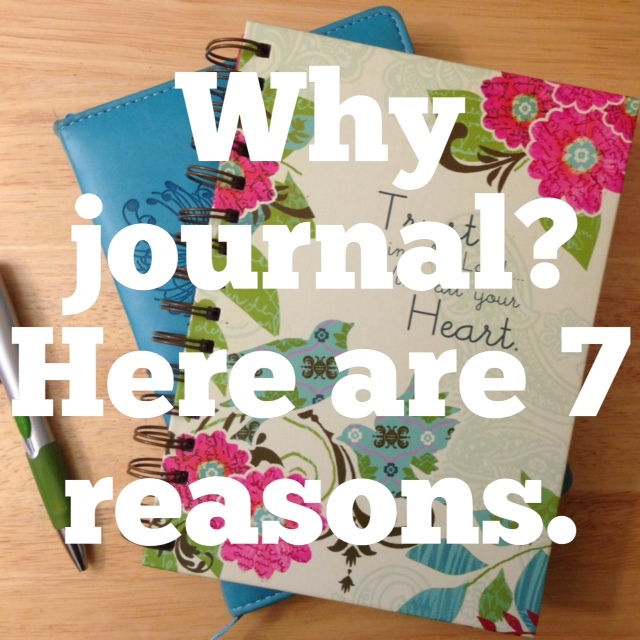 I can relate to all your seven points about journal keeping! Especially the part about clearing your head of so many thoughts! Inside my head can get quite tangled at times. Thanks for the great reminder of all the fantastic things journalling does for us! Wonderful post Joy! I’m going to share this on my FB page! I like to blog, but I really should get in the habit of journaling more! I agree that it’s such a good thing, for a number of reasons. Thanks for the inspiring post! I love journaling, too! Your reasons for it are insightful–I hope they’ll encourage others to give it a try. Thank you for sharing your thoughts!